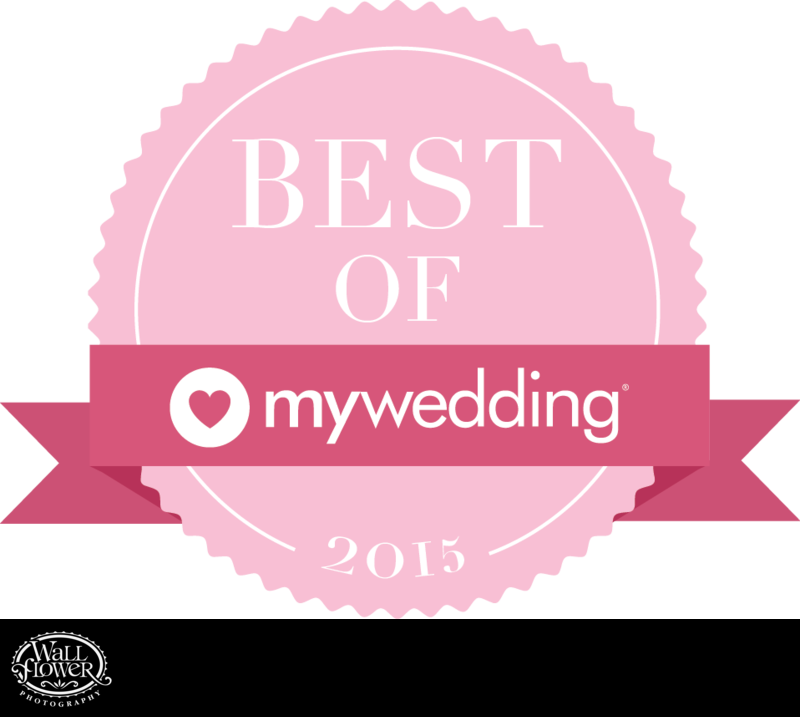 For the past four years, Wallflower Photography has been named the best wedding photography studio in Washington State by MyWedding, a leading national wedding resource website. We also hold Diamond Member status, and are one of just five Washington studios to be admitted into the prestigious Shane Co. Wedding Club. The WPJA consists of photographers worldwide who take a low-key, documentary approach toward wedding photography, focusing on capturing moments as they happen naturally instead of setting them up proactively. 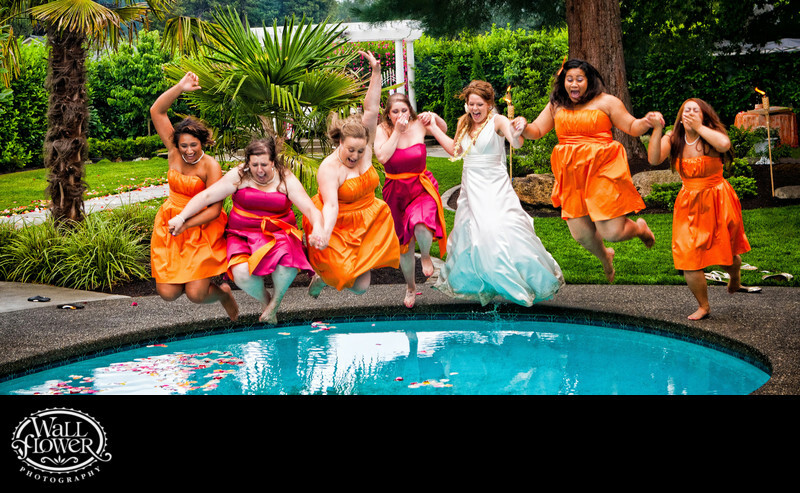 We first joined the WPJA in 2003, and combined, have won over 20 awards in their quarterly international wedding photography competitions, including 3rd for the photo above of the bride and bridesmaids leaping into a swimming pool. That's more wins than any other studio in Washington State, which is why Scott is currently ranked #1 in the state. 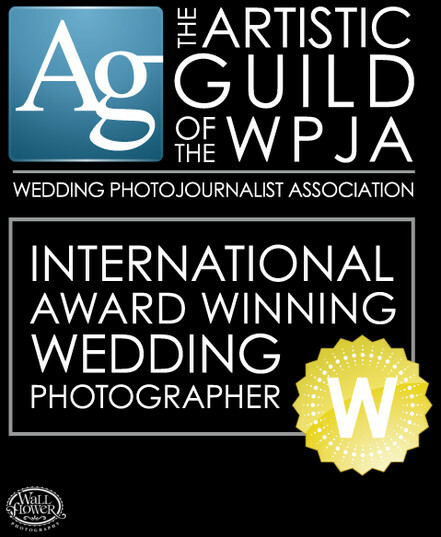 The Artistic Guild, a subdivision of the WPJA, shares the same focus on candid wedding photography, but with an additional emphasis on excellence in the art of post-production image processing. In 2006, Scott became the first Washington State photographer to win entrance into the AG|WPJA, and Laura joined him the following year. In the past four years alone, Scott has won 11 Artistic Guild awards, three of which were top-3 images worldwide, including 2nd place for the photo to right of the bride and groom's daughter licking her tears while sandwiched in the middle of their first kiss. Scott has been ranked in the World's Top 100 for the past four years. Unlike the WPJA, the PPA's annual International Photography Competition (IPC) rarely features candid photos because it rewards perfection in lighting and posing rather than reacting and capturing moments under less-than-perfect conditions. Each image is judged on 12 elements that include technical excellence, lighting, color balance, composition and creativity. It's rare for photographers to do well in both the PPA and WPJA, yet Scott has scored six award-winning photos in the past three years. In fact, in 2016 he ranked #2 among wedding photographers in the entire 12-state Western District. The year before, Scott managed to place a rare candid image (see below) in the PPA's prestigious annual Loan Collection book. As Wallflower Photography is based in Tacoma, we have enjoyed a long partnership with the leading wedding magazine for the South Puget Sound region. Many weddings photographed by Wallflower Photography have been featured by the magazine over the years, including three weddings and a party at the car museum in the latest issue alone. Scott has shot nine of their covers and counting, plus their past few major features on wedding fashion and trends. Our most recent work to be featured by Seattle Bride was Megan and Matt's 1920s styled wedding at the Weyerhaeuser Estate in Tacoma. We loved Offbeat Bride's feature of Michele and Douglas' wedding at The Fields at Willie Green's in Monroe, with our bride dressed in black, a collection of amazing 'fairy houses' as centerpieces, and quite a few other great details. 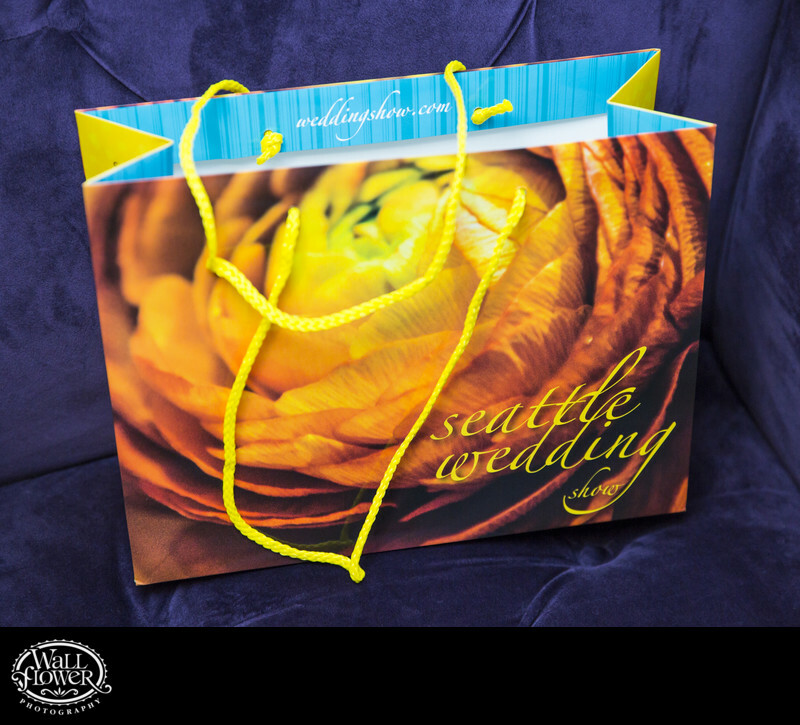 The producers of the Seattle Wedding Show have used three of our photos in all sorts of ways, including magazine advertisements, TV commercials, in the show magazine, on the show's signage and decor, and even on the swag bags that all attendees received, as you can see to the left.